Mount Diablo is a mountain in the Diablo Range, on the eastern side of Contra Costa County and the San Francisco Bay Area, southeast of both Concord and Pleasant Hill. 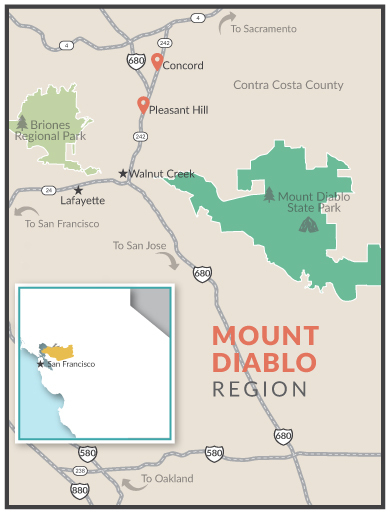 The Mount Diablo Region offers dog lovers the perfect blend of location, outdoor recreation, great restaurants and cultural assets, not to mention affordable hotels and motels. Visit Concord California with your pup and discover scenic trails with breathtaking views of the region, craft breweries along its ever-growing beer trail and an affordable, diverse food scene welcoming dogs to its pet-friendly patio restaurants. Pleasant Hill in Contra Costa County is at the center of everything. You'll find great restaurants, affordable lodging, friendly locals and close proximity to the world-class wines of Napa and Sonoma Valleys, outdoor exploration and family and dog-friendly attractions.